The Crow remake just can't catch a break. The long-gestating reboot of the popular comic book adaptation has been stuck in development hell for years. And just when fans thought it was happening, the rug has been pulled out again. Both actor Jason Momoa, who had officially signed on as the title character, and director Corin Hardy, have exited the project. The actor and filmmaker officially withdrew from the project this morning. It's believed that Sony was getting close to dropping the movie as its worldwide distributor, but that hasn't been made official. The grounding of the movie is said to be over creative and financial differences with Davis Films' Samuel Hadida, who holds the underlying rights and was putting up the money for the comic revamp. The Crow was set to begin shooting in the next five weeks, with the crew heading for Budapest. The movie was already in full pre-production mode, and Corin Hardy was ready to go. Sony has held the worldwide rights for distribution since last September. And they had already announced an October 11, 2019 release date. Insiders close to the production claim that deal never closed, and that Hadida's inability to get things done was cause for concern for Sony, who had one foot out the door. This is said to have 'directly precipitated the exits of the filmmaker and star'. 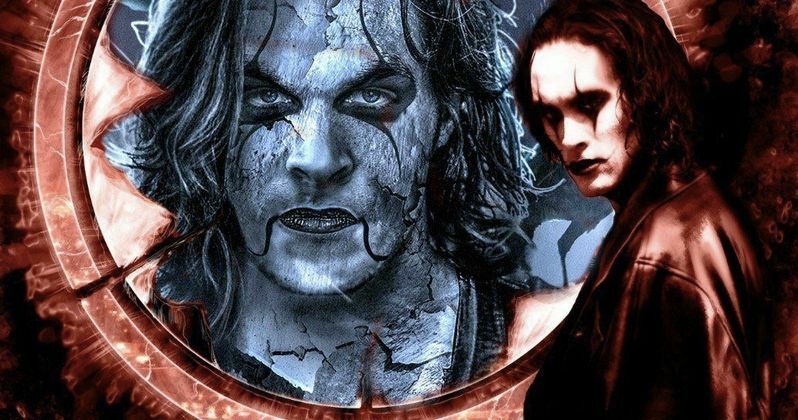 The Crow remake was set to be a more faithful adaptation of James O'Barr's original graphic novel. The title was already successfully turned into a movie back in 1994, but became notorious for the on-set death of star Brandon Lee. Many believe that this upcoming remake is cursed. This marks the second time Corin Hardy has bailed on the project, with many directors attached before he officially signed on. Relativity Media had initially signed Corin Hardy to direct The Crow. But the company faced creative and financial trouble, which caused the filmmaker to back away. The company eventually filed for bankruptcy, and Hadida swooped into acquire the rights. Highland Film Group became the project's next home, and Hardy was soon back in the picture, this time bringing Jason Momoa along with him. For the time being, it is unclear what will happen with the remake, and its quite possible that it will never happen. This news was first reported at Deadline.